Running is about more than just hitting the pavement. Strength training is crucial to improving form, efficiency and pace, and adding resistance bands to your workout is an easy, low-stress way to build strength in the muscles runners use most. We teamed up with Theraband to bring you the best resistance band exercises to make you a faster, stronger runner in no time. Why: Strengthening calf muscles can lessen the stress on your feet and legs as you contact the ground. Strong calves also support the ankles, preventing sprains and rolls. How to do it: Wrap a band around your forefoot. Grasp the ends of the band at your waist, taking up the slack. Push your foot down into the band. Hold and slowly return to start. Perform 8 to 10 reps on each foot. Do 3 to 5 sets. Why: Strong glutes support your hips, pelvis and spine, and are crucial for powerful running. How to do it: Place a looped resistance band around both legs and put your weight on one leg. Hold onto a chair or wall if you need to balance yourself. Keeping your free leg straight, extend it backward as far as is comfortable and return to start. Perform 8 to 10 reps on each leg. Do 3 to 5 sets. Why: This move strengthens the muscles around your ankle to prevent inversion sprains. How to do it: Sit in a chair with feet in front of you. Loop one end of a resistance band around the outer edge of your midfoot. Step on the loose end with your other foot. Lift, rotate and flex the toes of one foot up and away from the center of your body as far as you can, keeping your heels on the ground. Control the motion back to start. Perform 8 to 10 reps on each foot. Do 3 to 5 sets. Why: This move strengthens the muscles around your ankle to prevent eversion sprains. How to do it: Sit in a chair with one ankle crossed at the opposite knee. Place a looped band around both feet, with one end under the foot on the ground and the other end around the midfoot of the crossed foot. Lift and rotate your ankle away from the ground as far as is comfortable. Control the movement back to start. Perform 8 to 10 reps on each foot. Do 3 to 5 sets. Why: This exercise improves hip and knee stability and strengthens the muscles around the hips, which are crucial to efficient running. How to do it: Place a looped band around your ankles and stand with feet hip-width apart, knees slightly bent. Keeping your core tight and knees slightly bent, step one leg to the side and place it solidly on the ground. With a controlled movement, step your other foot in the same direction to return to a hip-width stance. That's one rep. Perform 15 to 20 reps in each direction. Do 3 to 5 sets. Why: Strong glutes support your hips, pelvis and spine, and can help power you through runs of any distance. How to do it: Place a looped band around one ankle and across the bottom of your foot. Lay on the ground on your stomach. Curl the leg with band around your ankle upward until your leg makes a 90-degree angle. Control the movement back to start. Perform 8 to 10 reps on each leg. Do 3 to 5 sets. Why: The squat is a full-body exercise that especially strengthens the largest muscles in your legs. 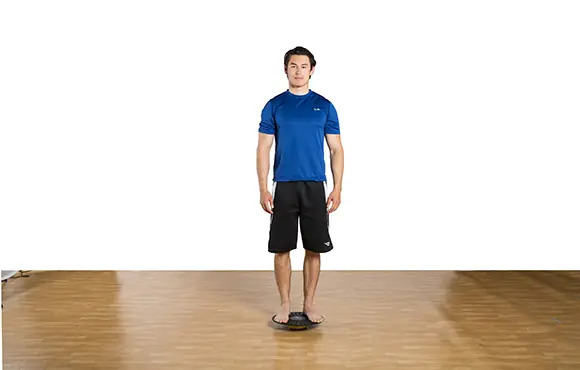 How to do it: Stand on a non-looped resistance band with feet hip-width apart. Try to make the ends as even as possible. Hold the ends in your hands at shoulder level. With your back straight and chin up, squat until your thighs are parallel to the ground. Without leaning forward or curving your back, slowly return to standing position. Perform 8 to 10 reps. Do 3 to 5 sets. Why: Each step you take is powered by your hip flexors. You want these healthy and strong. How to do it: Tie an unlooped resistance band to a stable table leg or pole, making it into a loop. Step into the loop and face away from the anchor point. With the band on your shin, start with your knee bent off the ground. Kick your foot forward until your leg is straight. Control the movement back to start. Perform 8 to 10 reps on both legs. Do 3 to 5 sets. Why: This exercise strengthens the quadriceps, one of the most important leg muscles in running. How to do it: Tie an unlooped resistance band to a stable table leg or pole, making it into a loop. Step into the loop and face toward the anchor point. Placing the band behind your knee, slowly allow your knee to bend forward, and then straighten it. You should feel more resistance in the straight-leg position. Hold briefly before bending your knee again. Perform 8 to 10 reps on both legs. Do 3 to 5 sets.